The world of digital scanning technology is fast moving and we constantly review our cine systems and invest in the latest cutting edge innovations. Our latest digital scanning cine equipment makes use of laser tracking technology. This not only provides phenomenal image stabilisation but also detects film shrinkage. All film shrinks over time, meaning that the distance between the sprocket holes changes. On less advanced, cheaper systems, this can cause the cine film to jam, damage and rip into the cine film. Another advantage of our current transfer system is that it is totally sprocketless. 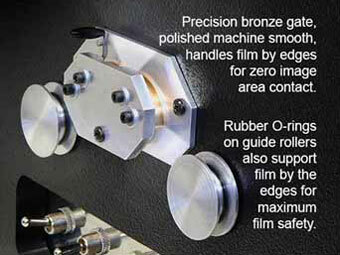 Film path transport is facilitated using soft rubber capstans which gently guide the cine film through the scanner. Our cutting edge digital cine scanners combined with advanced software and hardware control technology results in high quality cine transfers at our most affordable prices. The scanner utilises dual blue point laser sensors to constantly track the cine film. This can calibrate and compensate for film shrinkage, pin holes, damaged or torn sprocket holes which would cause further damage by jamming in normal machines. It also means that the image is incredibly stable. The data scanner is very kind to old cine film which may be in a very fragile state. Many systems have a pull down claw which pulls the film through using the sprocket holes. Our scanner uses high precision servo controlled capstan rollers which gently guides the cine film through the system. A super bright, low temperature LED light source is used which produces no heat and zero hot spots. It means that the film can be stopped and left in the gate without risk of blistering the film and causes irreparable damage. The scanning unit boasts multiple, in built sensors which keep the film at constant tension ensuring smooth delivery at the scanning gate. This ensures that the film is protected from damage and also protects the scanner by preventing damaged film from running through it. The hardware on the cine scanning units allow us to control colour balance and set exposure to manual & automatic control. Alternaware Cinecap Software is used to combine the individually scanned cine images at the correct frame rate to produce a seamless flicker free image. Industry leading software such as Final Cut Pro is used for editing and further film restoration when required. The advanced software that comes with the unit has a preset for colour negative and powerful colour correction tools that make colour neg transfers easy. Our cine unit can export in PAL or NTSC as standard definition or high definition. High definition files can be native 720p or up scaled smoothly to 1080p. These files can be .MOV movies or they can be numbered image sequences as JPEG, PNG, BMP or TIF. 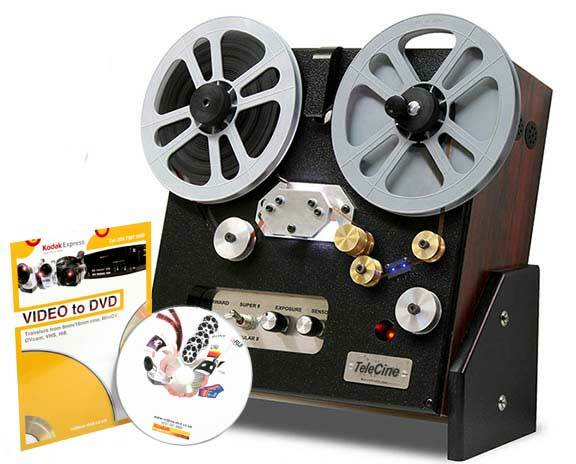 Home movie cine film generally runs at about 18-24 frames per second and this often varied over the length of the film according to the amount of juice left in the battery or clock work system. At no point dose the scanner touch the image on the film. There is zero contact at the gate and the rubber guide rollers handle the film by its' edges for maximum film safety. Most film with shrinkage, broken sprocket holes, or bad splices will navigate the film path with ease. Bad frames with broken or missing sprocket holes will automatically be skipped during transfer, making editing a breeze.On film with good sprocket holes solid state blue laser sensors means a rock steady image, generally accurate to within a pixel.